You seem to have landed in an endless dark hallway... or is it a house? - You don't know. You keep progressing through obscure rooms, halls and areas passing the servants of darkness; Trying to solve the mysteries that are lying ahead of you. Will this nightmare ever end? 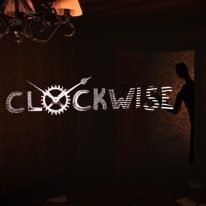 Focusing on the roots of classic horror games "Clockwise" uses the elements of darkness, sounds and visual trickery. The game can be played over and over again and never be exactly the same like it used to be before.